Fully encapsulated. chassis hole size dia. 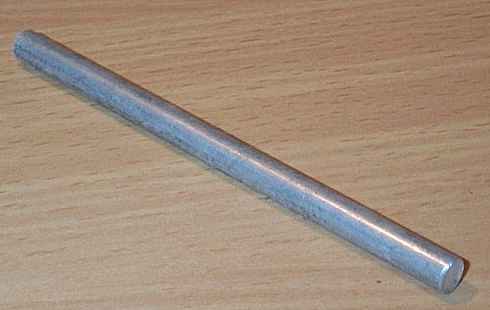 9mm, shaft dia. 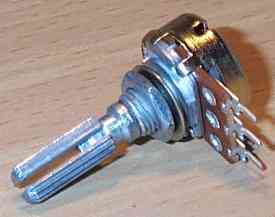 6mm, shaft length 12mm, bush height 8mm, body, 17mm(d) x 20mm(h) x 17mm(w), 1 nuts provided. 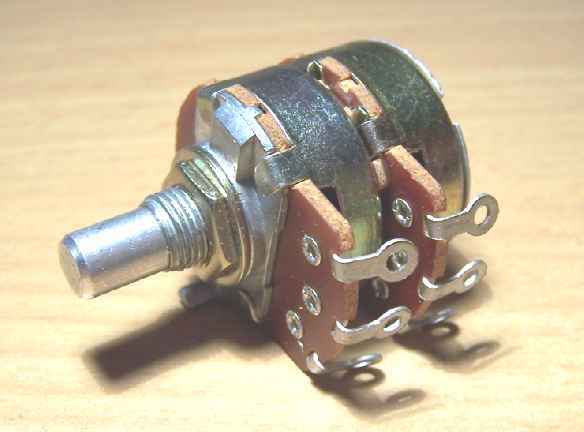 balance potentiometer, amazing quality. Fully encapsulated. 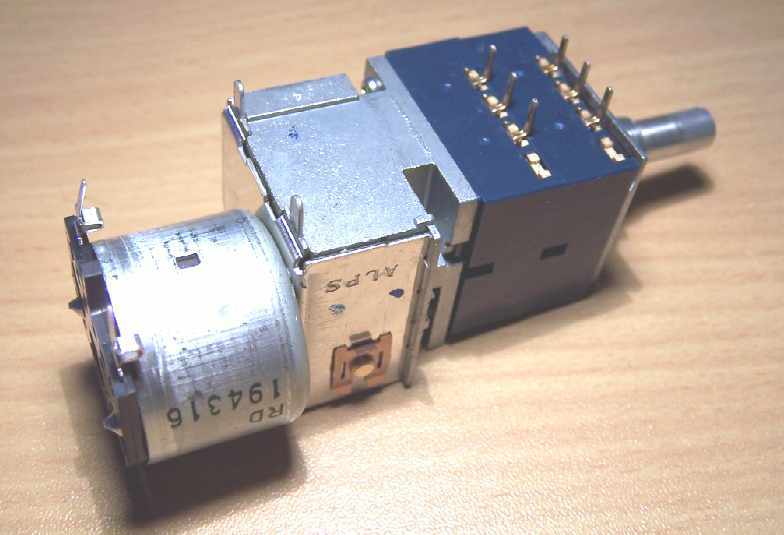 chassis hole size dia. 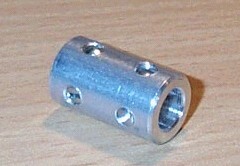 10.5mm, shaft dia. 6mm, shaft length 12mm, bush height 8mm, body, 17mm(d) x 20mm(h) x 17mm(w), 1 nuts provided. 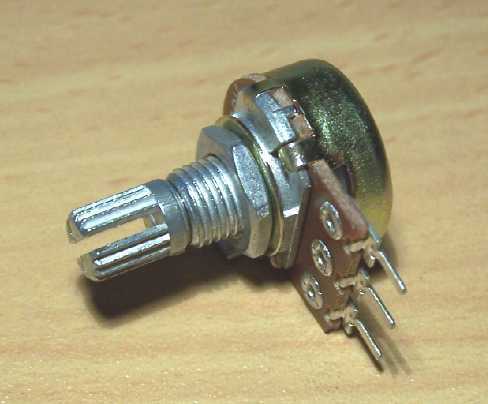 encapsulated potentiometer. Rugged construction, metal bush and shaft, carbon brush wiper. 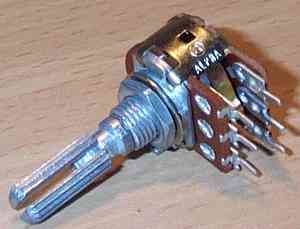 Ideal for use as a "humbuckers" for directly heated triode amps, to cancel out hum. Dim. (in mm) body dia. 22, L 12.7. Shaft dia. 6.35, L 25. Mounting bush dia. 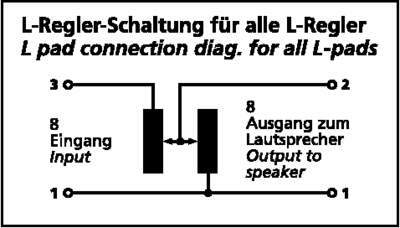 9.5, L 10. 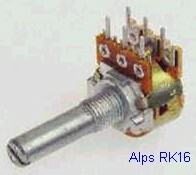 ALPS RK16 - 10K x 1 LOG (A) NO microclick mono 0,05 W 150V, strato di carbone, corpo metallico mm 16 profondo mm 10,5 albero diam. 6 mm, lungo mm 25 fissaggio filettato mm 7 mono 0,05 W 150V,carbon layer, metal body mm 16x10,5 deep, shaft diameter mm 6, lenght mm 25,fixing with mm 7 thread. 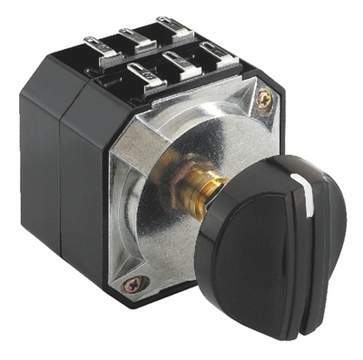 ALPS RK16 10K x 2 LOG (A) stereo NO microclick 0,05W 150V, strato di carbone, corpo metallico mm 16 profondo mm 13 albero liscio diam. 6 mm lungo mm25, fissaggio filettato mm 7 Stereo, 0,05W 150V, carbon layer, metal body mm 16x13 deep, smooth shaft diameter mm 6 lenght mm 25, fixing with mm 7 thread. 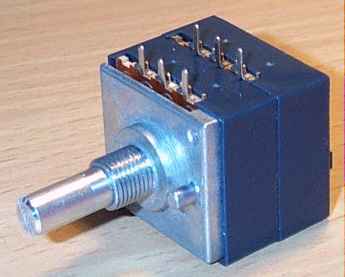 NO microclick stereo, 100 db dynamics range, brass body sealed mm 50x56x38 deep, shaft diameter mm 8, fixing with mm 12 thread. 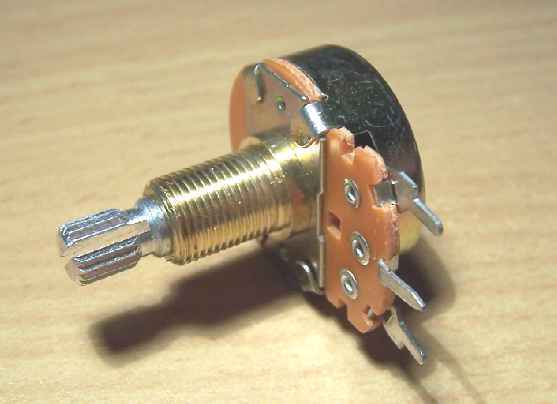 stereo, 4 - 6V 100-150ma motor supply, metal/plastic body, outside dimension mm 26x25x45 deep, shaft diameter mm 6, fixing with mm 9 thread. 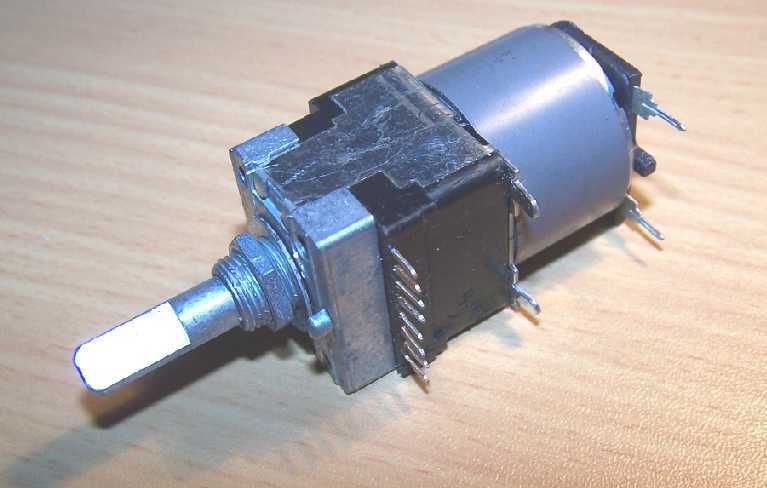 motor supply, metal/plastic body, outside dimension mm 37x35x70 deep, shaft diameter mm 6, fixing with mm 8 thread. 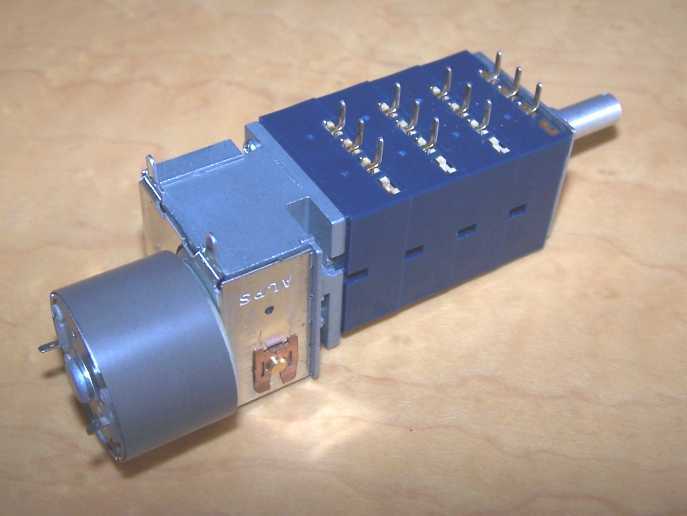 quadruple, 4-8V 150ma motor supply, metal/plastic body, outside dimension mm 37x35x110 deep, shaft diameter mm 6, fixing with mm 8 thread. 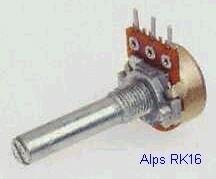 ALPS RK16 - 10K x 1 LIN (B) mono NO microclick0,1W 150V, strato di carbone, corpo metallico diametro mm 16 profondo mm 10,5 albero diam. 6 mm, lungo mm 25 fissaggio filettato mm 7 mono, 0,1W 150V, carbon layer, metal body mm 16x10,5 deep, shaft diameter mm 6 lenght mm 25,fixing with mm 7 thread. 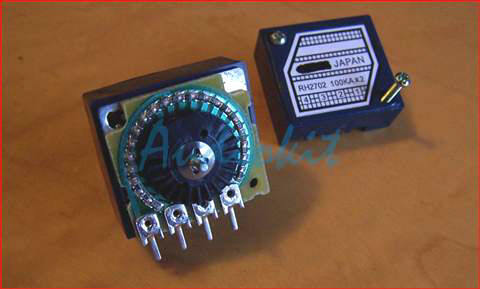 ALPS RK16 10K x 2 LIN (B) stereo NO microclick 0,1W 150V, strato di carbone, corpo metallico mm 16 profondo mm 13 albero diam. 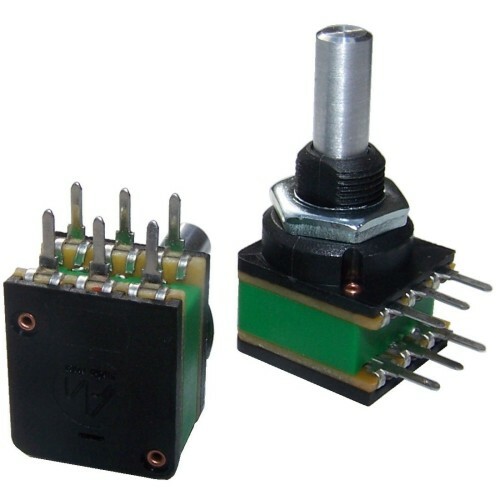 6 mm lungo mm 25, fissaggio filettato mm 7 (stereo), 0,1W 150V, carbon layer, metal body mm 16x13 deep, shaft diameter mm 6 lenght mm 25, fixing with mm 7 thread. La situazione dei potenziometri ad uso Audio, non è delle più felici, normalmente i quantitativi richiesti dai pochi produttori esistenti, sono molto elevati, si prega di non richiedere valori e modelli non rappresentati su questa pagina. 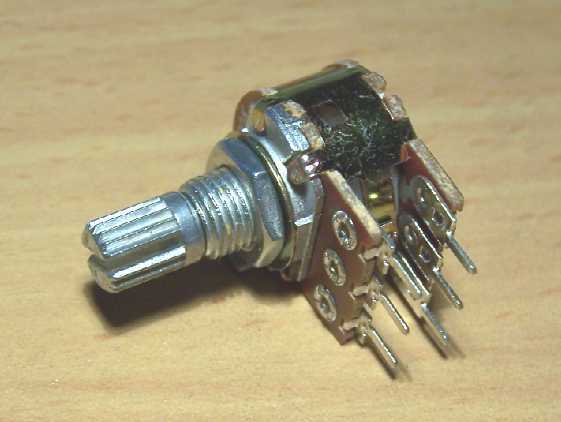 Audio Potentiometer situation is not happy, some big factories not manufacture more some items, or build it only "custom" potentiometers in big industrial stock. Non è possibile dividere il Kit, non possiamo fornire le parti staccate ! !